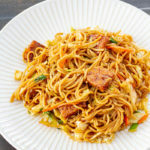 Japanese stir-fried noodles with tempeh bacon. Marinate the tempeh pieces in the bacon marinade for 10 minutes. Put the marinade and the tempeh in a skillet over medium heat. Bring the marinade for a simmmer, turn the heat to medium-low, and cook for 5 minutes, turning the pieces over occasionally. Remove the tempeh from the skillet and set aside. In a large skillet, or wok, heat the 1 1/2 teaspoons of toasted sesame oil. Add the cooked yakisoba noodles and stir-fry for 1 minute. Add the 1/3 cup of yakisoba sauce and stir well until the sauce has been evenly mixed into the noodles. Add the salad mix and bacon and cook for another minute or so, or until the salad mix is cooked to your liking. Add any garnishes, if desired. Serve hot and enjoy. *If you aren't gluten-free, sometimes you can find fresh yakisoba noodles in supermarkets. If not, look in the Asian section of your supermarket and look for "chuka soba" noodles. They aren't buckwheat noodles, despite the word soba being used. If you can't find those, you can always substitute angel hair pasta in a pinch!